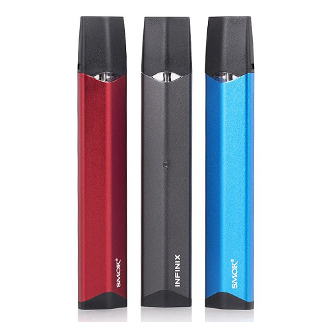 The Smok Infinix 250mah Kit is an All-In-One vaping device with a classic automatic style. This means NO BUTTONS, just inhale and enjoy the tasty vapor this device delivers. This kit uses a 2ml refillable pod/cartridge system that makes your vaping experience quick and easy. Simply fill one of the empty pods with your favorite flavor of e-liquid and you're ready to go. This Pod system works best with Nic Salts or high PG liquid. DO NOT use high VG liquids in this device as it can/will gunk up the atomizer. This palm-sized device is designed for discrete vaping or for someone with limited space. It has a 250mah battery with an output wattage of 10-16W and has a battery life indicator light to help you keep track. To charge, use the designated micro USB cord (included). The Infinix also has an eight second cut-off as well as short circuit and low voltage protection.